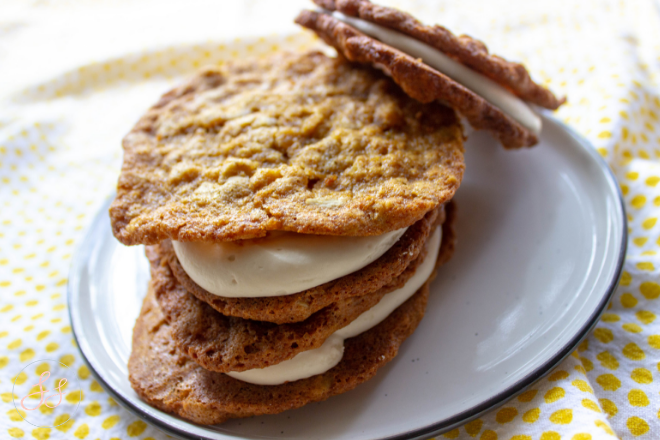 I've been craving those sweet Little Debbie Oatmeal cream pies that I used to enjoy pre-gluten-free life. 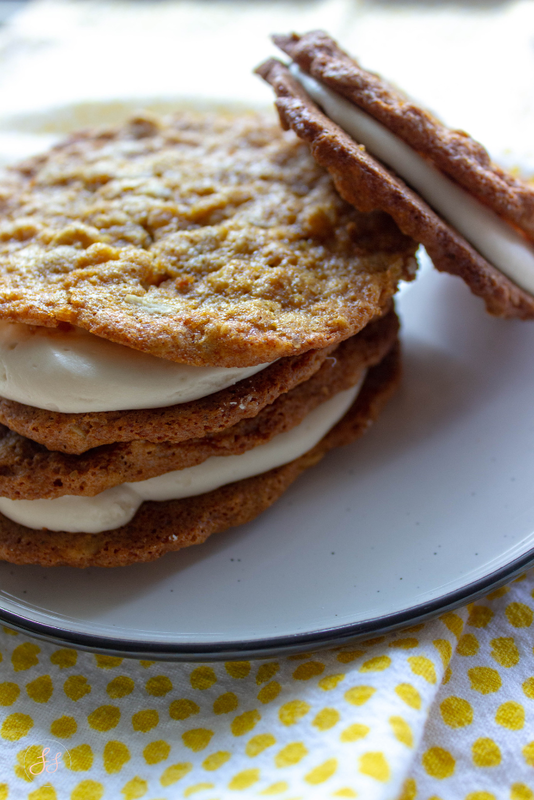 Something about spring makes me think of these sweet oatmeal treats. This recipe is very simple but requires a few tricks to make it perfect. Especially when it comes to the dainty oatmeal cookies! So be sure to read my recipe carefully and the notes as well! Pre-heat oven to 375.In a mixer (or with a hand mixer) whip together butter, shortening, and vanilla till smooth and fluffy. Add in sugars, maple syrup, and eggs. In a separate bowl, combine flour, salt, baking soda, and cinnamon Slowly add the flour mixture to butter mixture and blend together. Once well blended, stir in oats.Place tablespoon sized balls on a parchment lined baking sheet.THEY WILL SPREAD, so I suggest, depending on the size of your pan I suggest only putting two to a row with a good amount of space in-between.Baked for 12-15 minutes till the ends start to brown but the middle is still soft.My suggestion, is because the cookies will be VERY soft, is to let the cookies cool ON the parchment paper. 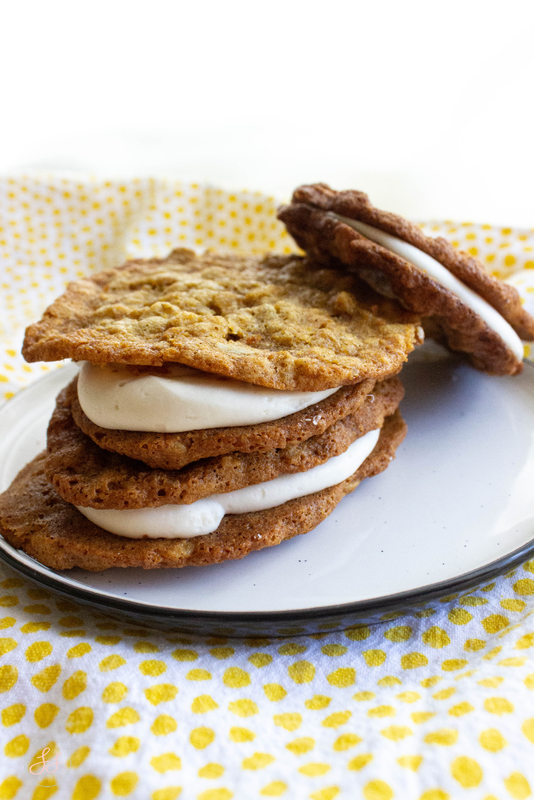 Because they are so light, you should be able to remove the parchment with the cookies on top easily to a cooling rack.While the cookies are cooling, make your cream.Creamy the butter (1 stick)and vanilla together till soft.Slowly add in powdered sugar. Alternating sugar and milk till you have the taste and consistency you desire.Pipe the cream onto the cooled cookies and sandwich together.Store in the fridge to keep them firm. You can freeze any extras till you need them!